Genießen Sie ein 4-stündiges Geländewagenabenteuer zu den Wasserfällen auf Kauai! 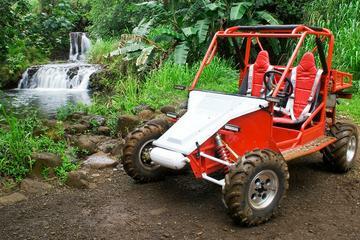 Reisen Sie als Fahrer oder Mitfahrer in einem offenen Geländewagen durch die üppige tropische Landschaft von Kauai zu einem schönen Wasserfall, wo Sie ein erfrischendes Bad nehmen können. This excursion was perfect for two parents and two young adult children. Rented two mudbugs and had a blast. Guides very informative of the history and very entertaining. Stopped at a waterfall area to swim, had a snack and toured an WWII Bunker. Anyone who rates this trip poorly wasn't meant for mud!!! They do a good job of keeping you safe, and driving these little bugs is definitely a blast. But the waterfalls in the title is a big misleading. You don't go very far into the countryside. There is some pretty scenery. If you go, wear a jacket and warm sweatshirt because you're going to be exposed, like on a motorcycle. The so-called ponchos they provide are a joke. It was an amazing experience! The tour guides were very informative, as well as fun! A great adventure to do on the Island, and on our Honeymoon. We recommend this 100 a MUST do! Had an amazing time Our guides Koa and Abe were wonderful. The gas fumes were a bit much by the end but the mud was expected. Wear your bathing suit under the t-shirts and shorts they offer. The history of the valley and bunkers was a great touch and of course the scenes shot for movies were very familiar. Loved the waterfalls and ponds got off some of the mud My only suggestion is to make the address for GPS clearer, we weren't the only ones who got lost and waited for the last couple awhile before they finally found us. The first address is private house. And 2nd address is not on the right if you're coming from the first, nor is the building beige/tan...it's green. But all in all it was a great excursion. Don't bother wasting your money!!! This tour is not exactly as Viator explains it. There is only one waterfall not two. There are no sandwiches you only get chips and a drink. Don't know why Viator has you list what type of sandwich you want. 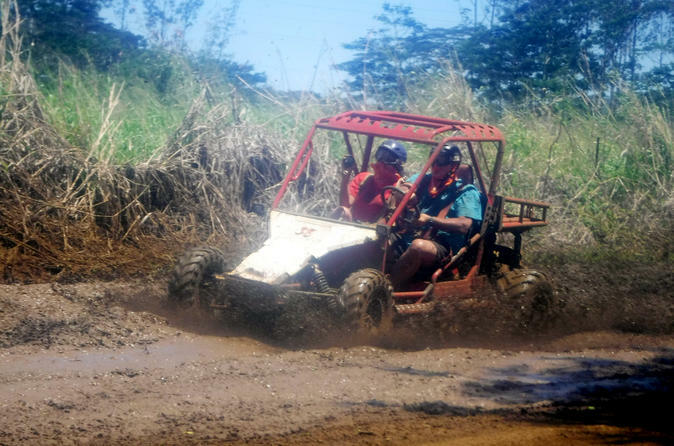 Kauai ATV Tours vehicles were all faulty. Out of the seven groups that were on the tour 5 of the vehicles had to be replaced during the tour. Spent most of the tour sitting on the side of the road waiting for replacement vehicles. At our first stop one couple's vehicle had no steering control at all. The second stop another vehicle had to be replaced to not starting up and had blue smoke coming out of while driving. The third stop our vehicle had to be replaced due to no suspension and brakes not working and we had a bald tire while the others looked brand new. When they brought us a replacement it still did not have breaks. We were not the only ones complaining about not having breaks that worked. Another couple ended up leaving the tour early because of not have workable breaks and steering did not work properly either. They did not feel safe to continue on with the tour. At the end of the tour every one seemed very unhappy and dissatisfied with the tour. Their equipment is not safe and we asked around the island at other tour agency's and they all said the same thing. They don't recommend them due to faulty equipment. I booked this tour for my husbands birthday and was very upset that it turned out to be a disaster. One of our all time favorite adventures anywhere! Loved this and would do it again in a heartbeat!!! Absolutely amazing! the tour takes you through many historical areas throughout Kauai, even showing you where they filmed multiple movies such as Jurassic Park! The tour guides were very fun and knowledgeable about the island and they clearly enjoyed their jobs. You get very dirty on the trip which is a lot of fun and you get to wash it all off in a beautiful natural waterfall and also visit one of the first WWII bunkers built on the island. Overall it was a great experience and I look forward to going back for the zip line adventure as well. Some of the most fun I've had in a long time! Amazing tour. The girls were great and had alot of information. Alot of fun.